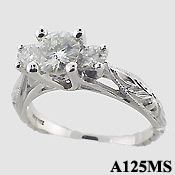 Stock #A125:Antique style Ring. 3/4 carat center w/ .10 ct side stones. (These Russian CZs are more precisely cut & polished from the finest quality CZs) Satisfaction Guarantee!! Picture does not do justice to this piece!